I can’t imagine anything that appeals to all age groups more than a good bowl of spaghetti and meatballs. 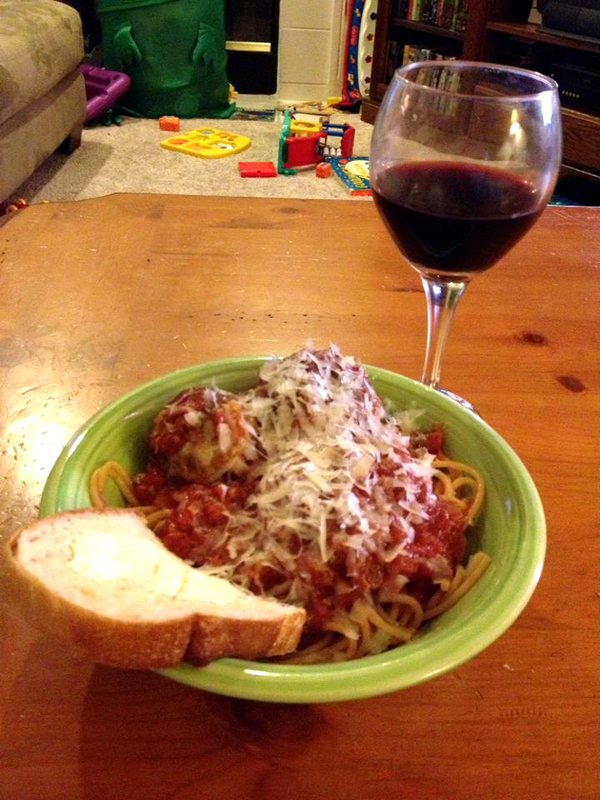 Pasta, the ultimate comfort food, paired with tender, garlicky meatballs, crunchy bread, and a glass of a nice red is heavenly fare. If there are any meatballs left over, it’s always good to slap them between two pieces of crunchy bread topped with sauce and some melted mozzarella cheese for a delicious sandwich. I really love good meatballs, and I love to make them. And save yourself some time by baking the meatballs, rather than frying them in batches – you’ll also have a cleaner stove top. I’ve made meatballs from lots of different kinds of ground meat: beef, turkey, pork; but I like a combination of really lean beef combined with an equal amount of ground pork. The pork has enough fat to make the meatballs tender and adds flavor. And soak torn bread in milk before blending in with the meat – another must for tender meatballs. Tender meatballs and homemade sauce is ideal comfort food. in a medium bowl, add milk and torn bread, mix and let stand for 5 minutes until the bread has absorbed the milk. Add the ground beef and pork, beaten eggs, onion, parsley, garlic, salt and pepper. Mix gently until well blended. Try not to over mix or pack the meat mixture to make sure the meatballs cook up juicy and tender. Shape into 18 - 24 meatballs, depending on how big you like them. I like mine on the large side 2 inches or so. Spray a large, shallow baking pan with non-stick spray, and evenly space meatballs on the baking sheet. I spray the meatballs across the top with cooking spray, too, maybe to help them brown. Bake the meatballs for 25 minutes in a 425 degree oven. I like to separate the meatballs on the platter and pour the sauce over the cooked spaghetti to make sure the pasta is coated. Sometimes, I add Parmesan cheese to the sauce at the end of cooking, and sprinkle on extra at serving. And don't forget crusty bread or rolls, or garlic bread to serve along side this tasty dish!